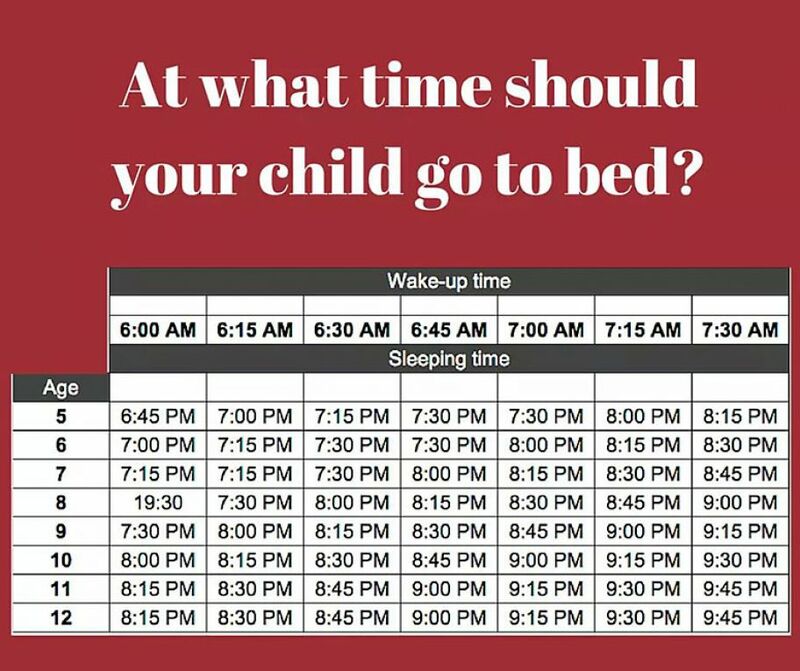 While the information aligns with widely recommended guidelines for sleep it does surface some of the challenges of actually meeting these guidelines, from parents often working into the evening, out-of-school activities and homework sticking to these numbers is really challenging. 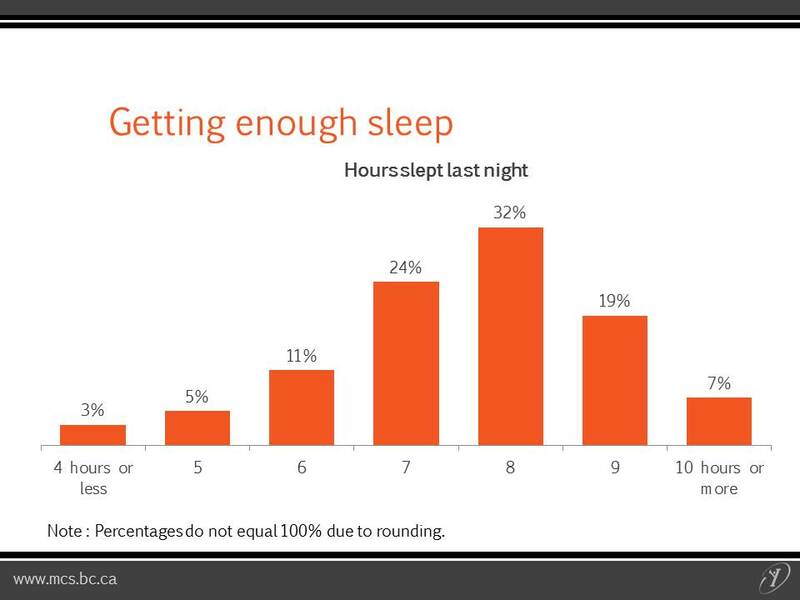 I was reminded of the sleep dilemma this past week listening to North Shore Medical Health Officer Mark Lysyshyn. In his presentation What You Need to Know About the Health of Students, so much of it kept coming back to sleep. 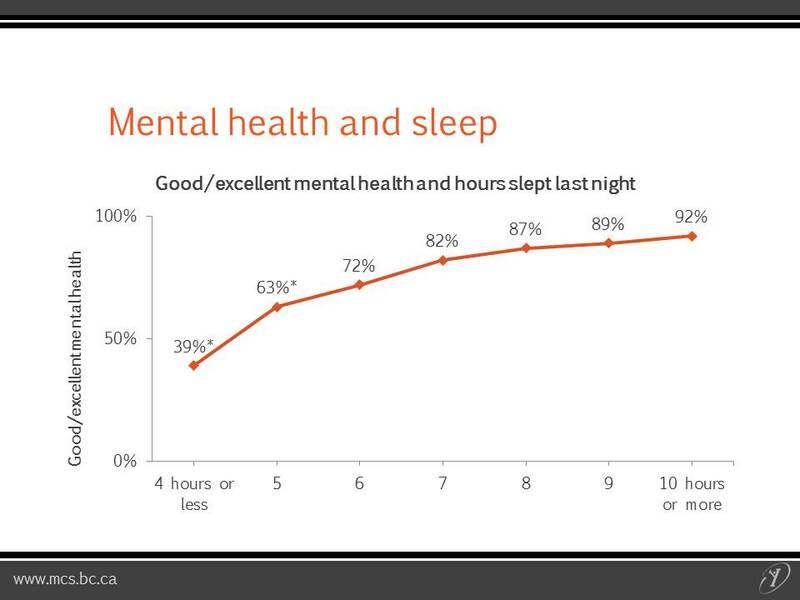 Issues like physical activity, mental health and safety are all important, but the lack of sleep was pronounced. Two particular slides from the 2013 BC Adolescent Health Survey emphasized the challenge. It was interesting the discussion that followed with parents. The community data also indicated the need for students to be getting exercise and participating in sports and many discussed how it was this participation in organized sports that often cut into sleep time – really a no-win situation. We want our kids to be active and to get 8 or 9 hours of sleep – but soccer practices can go to 9:00 at night and school often starts by just after 8:00 in the morning. Of course there is also persuasive data that indicates later start-times for school would be helpful but very few jurisdictions have built this into the systems. Clearly we have structures in our lives that make it hard to adhere to the recommendations. Media have been regular reporters of this – including this comprehensive story from Global News this fall. Have a relaxing bedtime routine. Have a light snack (such as a glass of milk) before bed. Try to go to bed at about the same time every night. Keep your room cool, dark and quiet but open the curtains or turn on the lights as soon as you get up in the morning. Always fall asleep in your bed. Use your bed for sleeping only. Avoid doing homework, using a computer or watching TV while in your bed. Try to be in your bed with the lights out for at least 8 hours every night. Napping during the day can make it difficult to fall asleep. If you want to nap, keep it short (less than 30 min). Definitely don’t nap after dinner. Get exercise every day, but avoid very hard exercise in the evening. Avoid caffeine (coffee, tea and sodas) after mid-afternoon. Don’t use any products to help you sleep such as alcohol, herbal products or over-the-counter sleep aids. Limit screen time before bed. Using electronic media and being exposed to the screen’s light before trying to sleep can make it harder to fall asleep. On weekends, no matter how late you go to bed, try to get up within 2 hours to 4 hours of your usual wake time. This is especially important if you have trouble falling asleep on Sunday nights. Make sure you are not trying to do too much. Do you still have some time for fun and to get enough sleep? If you are having trouble sleeping because you have too much on your mind, try keeping a diary or to-do lists. If you write things down before sleep, you may feel less worried or stressed. There seems to be more and more research around the power of sleep. From athletic performance to academic performance and letter grades in school. It is one of those issues that seems so simple, but just isn’t. I know in looking through the list of tips for helping young people get a good sleep – I am often missing the mark as a parent. Thanks for yet another very informative and provocative post, Chris. For all these reasons, and more, the practice of “sleep hygiene” needs to be more fully and seriously considered with our youth and population at large. “Over the past few years, teachers and counsellors at Vancouver Technical Secondary grew increasingly concerned about student stress, which ranged from pre-test jitters to breakdowns. As part of an effort to get a grip on the issue, the school, with help from researchers at the University of British Columbia, conducted a survey last spring to measure students’ well-being. Perhaps coincidentally, that same month I took part in an informal Pro-D discussion with other educators about the noticeable change in even elementary school students’ wakefullness over the past few years. Anecdotally, we all converged on the (over)use of electronic devices, before bedtime and during the night. Apparently, many students have their screens (computers, iPads, iPhones) in their room and continue to use them throughout the night. A result is very sleepy students during the day. * One of our school board psychologists (also a former UBC SpEd instructor of mine) then explained to us that there is growing concern about the AMOUNT of exposure young people have to electronic screens, period. > She further suggested that the maximum time they should be looking at screens (of any size) in one day was around 60 minutes = 1 hour. That’s it. I understand that the concerns in the academic community ranged from impacts on children’s eyes through to brain development, in part related to the decrease in sleep. In my classrooms I encourage students to make better choices about using devices (when and what for), and to increase the time they spend actively moving (outside or inside), socialising face to face with family and friends, reading actual books, magazines, newspapers, etc. For all the great offering these electronic technologies and devices provide as tools, they can not, and in my opinion should not replace the multitude of other (more) pro-social activities with people and our natural environment. Especially for our young people who have grown up attached to these important tools, I believe we need to develop a better, broader framework for helping them understand the human (anatomical and biological) needs which require them to make their own informed, healthy choices about sleep and so many other aspects of their growth. There’s a lot to look at, consider and develop here. Thanks for keeping the conversation going !! Thanks Kari for pushing the conversation forward – a very interesting article. There is definitely a link of the sleep conversation to the screen time issue. The surveys of young people on their phones at night and even sleeping with their phones are very startling. 10 years ago we often discussed keeping screens in common areas – but as we have moved mobile, I am sure screens are in almost every teenager’s bedroom and their use at night is definitely getting in the way of sleep. Another great reminder that student achievement isn’t nearly as important as student well-being. Which makes me wonder what role schools can and should play in addressing this specifically? I think we are talking about student well-being more now than at any point over the last two decades. We are far more conscious of mental health challenges and moves around reducing homework volume, for example, are often built around trying to allow students greater balance. While at the same time we are doing this – we may also be in a place where pressures are greater around academic success and where the programming of young people’s lives has never been greater. When we try to address student well-being we seem to be fighting against those who see any efforts as a watering down of the system or a reducing of standards. The whole issue of school start times is interesting – it does seem like it should be easy to change – but it really hasn’t been done in very many places. Like any good blog . . . this is about do as I blog not as I do . . . I am guessing the recommendation is a little higher than my current actual sleep totals.